Unfortunately, the simple reality is that working out on a treadmill can become quite monotonous, and you may end up dreading your workouts if you really can’t stand being on your treadmill, no matter how high-tech it is, because you cannot seem to keep yourself motivated. But one of the strategies that a lot of people employ while they are on the treadmill involves listening to the right music. Think about how different types of music make you feel. For example, when you are stressed out, what music do you typically listen to in order to calm down? And when you are tired, what genres do you prefer to listen to because they are actually able to get you up and moving? After you figure out what genres help you feel different emotions and energy levels, you can choose the right music that is perfect for you to listen to during your workout. Different songs can help you get through the different parts of your workout, so switch things up. There are so many different styles of music out there, and millions of songs to choose from. Therefore, it can be difficult to narrow down these song choices to the ones that will really work for everyone when they are trying hard to get through a tough workout on a treadmill. That is why we won’t bother listening actual songs within this article. Instead, we will focus in on what or styles of music and, more specifically, what tempos, you can listen to throughout the various phases of your time on the treadmill. Different songs can help you get through the different parts of your workout, so switch things up. Taking our suggestions is the first step, but, again, because there are so many musical options to choose from, it really is ultimately up to you to decide what works for you and what doesn’t. Warming up is the first step that you need to take every time you step onto the treadmill if you want to have a safe, effective workout that will relieve, rather than cause, your aches and pains. This is the time in your workout routine that you can take to really prepare your body for what is ahead. If you are unable to warm up your muscles properly, you do increase your risk of injury, so you definitely do not want to overdo it, both physically as well as musically. 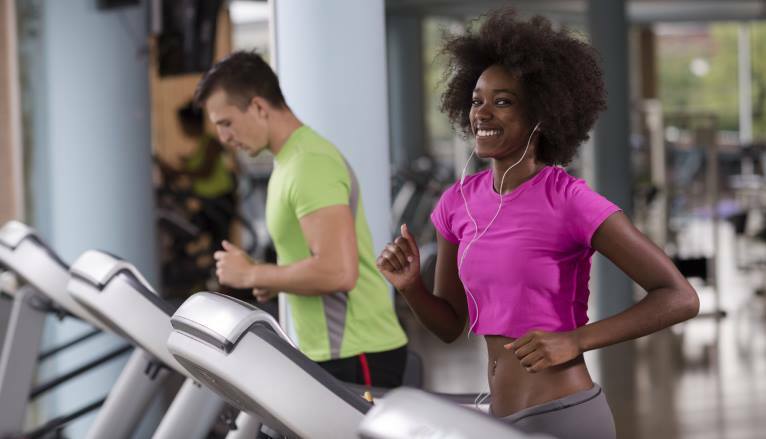 For this particular phase of your workout, choose music that is mid-tempo. Even a lower tempo song will do. The key, though, is that the songs you choose will get you motivated and will begin to energize you, so just be sure you do not pick songs that are too relaxing because you will have a harder time getting going as a result. A good rule of thumb is to warm up for about 5 minutes or so with this type of music before you dive into your actual cardio routine. After your warm-up, you should begin to walk more briskly and take yourself into a slow jog. Mid-tempo songs are still appropriate here, especially when you can easily make out the beat and bass line because you will be able to follow the tempo of the songs with the pounding of your feet on the treadmill. As you progress into a run, you want the tempo of your music to increase with the energy in your body. This will really get you moving, especially if you turn up the volume as well on your favorite high-tempo songs. Fast-paced songs that get you moving should also make you happy, so do not choose songs that make you angry or aggressive, as this could cause you to sacrifice your form. Finally, when it is time to cool down slowly, it is time to switch up the songs on your playlist yet again. If you bring yourself down to a brisk walk first, stick with a mid-tempo song yet again. This will help you bring your heart rate down and will also allow your mind to slow down as well. Once you have completed this portion of your workout, it is time to cool down and slow down even further for the last few minutes of walking on the treadmill. For this point in your workout, a slow-paced song that really relaxes your body and your mind is best. Again, you want it to be a positive, rather than a depressing song. Also, you want to be able to loosen up and stretch out after you get off the treadmill, so slow songs will help you take the extra time you need to be sure your body has properly cooled down after an intense run.